Today part 2 of the Anniversary CAL is published. You can find it on Ravelry and LoveCrochet. As you can see the 2 motifs work together well, I designed the sizes so that they did! Part 2 of the pattern includes a suggested layout if you’d like to make a blanket or throw with just these 2 styles of motif, but there are plenty of other options available – just use your imagination (and maybe a little maths!). 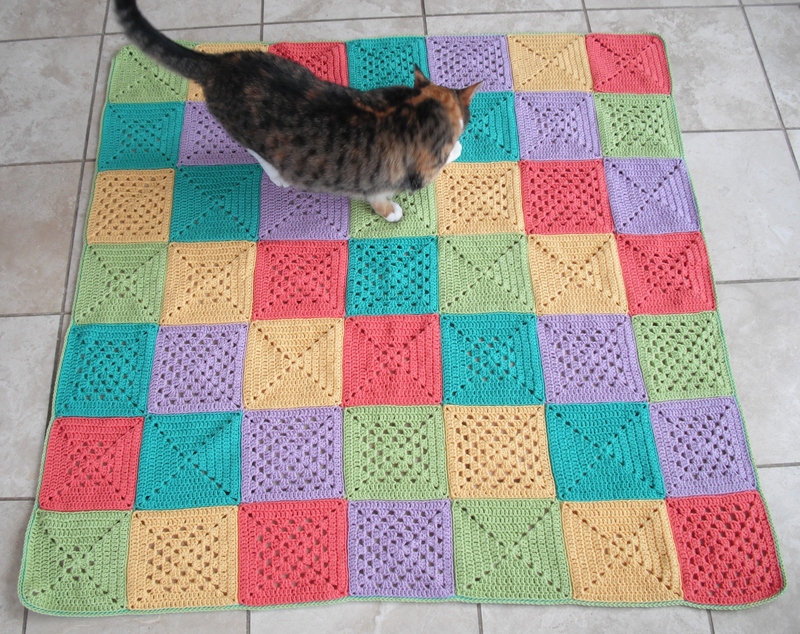 If you haven’t already joined in the CAL, please do – I love seeing what everyone makes with the motifs. Last week I promised you something a little different, well maybe it is different but then again maybe it isn’t! Firstly, you will have noticed it is bigger. It is designed to be 4 times the size of squares 1 to 3, or twice the width and depth. 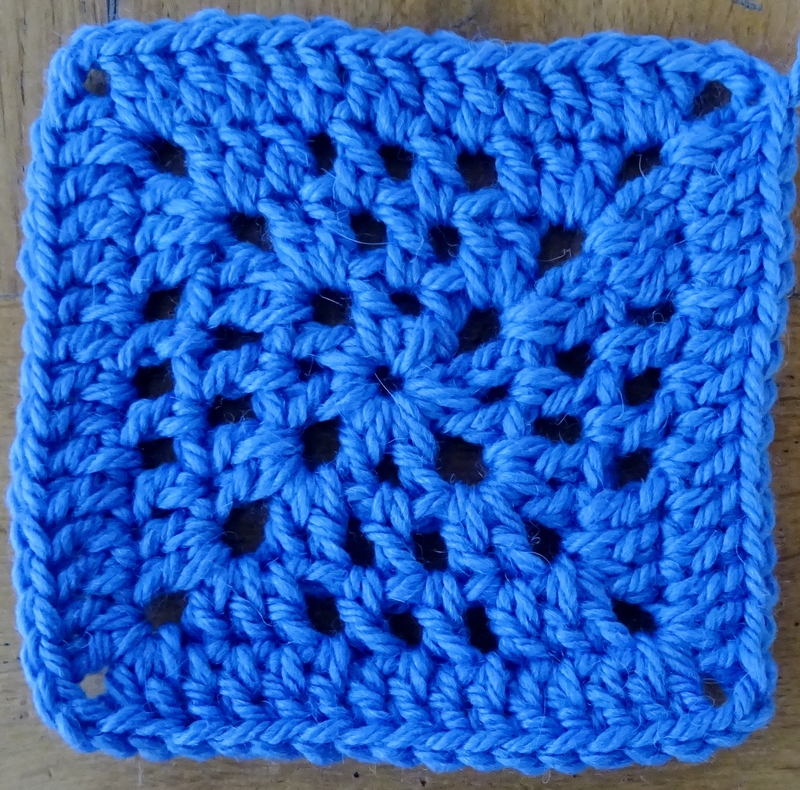 This will make the design more interesting, as you need to fit both sizes of square into your blanket. 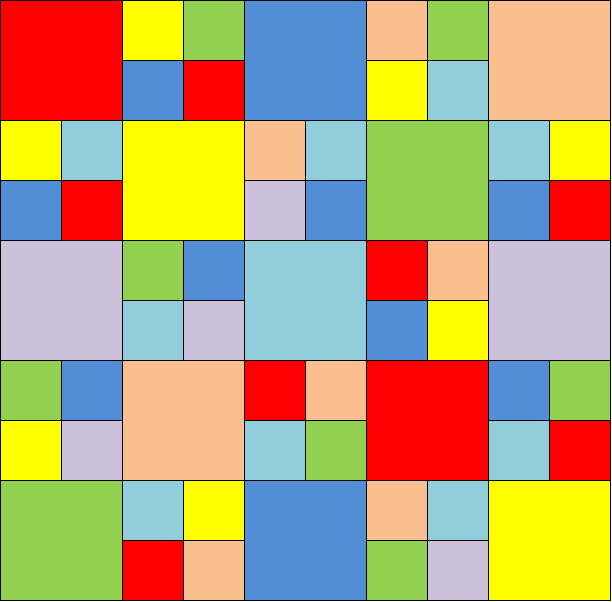 Second is is very similar to square number 3, but it has more rounds. 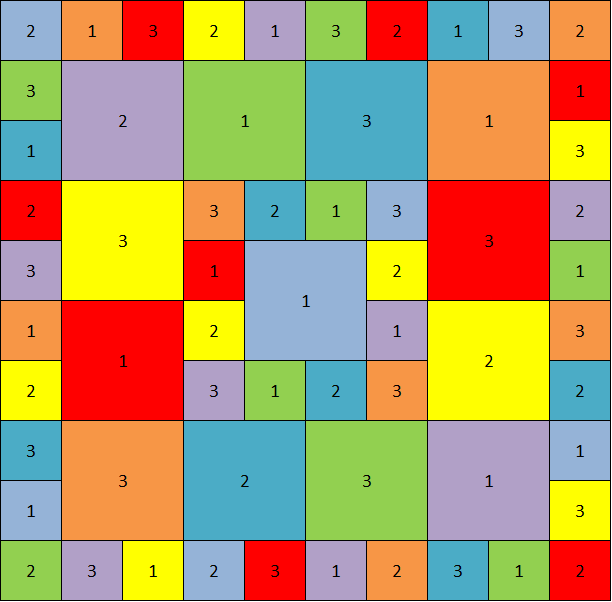 Round 2: ss into 2ch-sp, (note for this and each subsequent round: this ss is to position the start of the round in the right place) 5ch (counts as 1tr, 2ch), 2tr into the same 2ch-sp, *1tr in next st, 1tr in 1ch-sp, 1tr in next st, (2tr, 2ch, 2tr) in next 2ch-sp; repeat from * another 2 times, 1tr in next st, 1tr in 1ch-sp, 1tr in next st, 1tr into first 2ch-sp, join to 3rd st of starting 5ch with a ss. Round 3: ss into 2ch-sp, 5ch (counts as 1tr, 2ch), 1tr into the same 2ch-sp, 1ch, *(1tr in next st, 1ch, miss 1 st) 4 times, (1tr, 2ch, 1tr, 1ch) in next 2ch-sp; repeat from * another 2 times, (1tr in next st, 1ch, miss 1 st) 4 times, 1tr into the first 2ch-sp, join to 3rd st of starting 5ch with a ss. Round 4: ss into 2ch-sp, 5ch (counts as 1tr, 2ch), 2tr into the same 2ch-sp, 1tr into each st and 1ch-sp around, (2tr, 2ch, 2tr) into each 2ch-sp, and work a final 1tr into the first 2ch-sp, join to 3rd st of starting 5ch with a ss. Round 5: ss into 2ch-sp, 5ch (counts as 1tr, 2ch), 1tr into the same 2ch-sp, 1ch, *(1tr in next st, 1ch, miss 1 st) 8 times, (1tr, 2ch, 1tr, 1ch) in next 2ch-sp; repeat from * another 2 times, (1tr in next st, 1ch, miss 1 st) 8 times, 1tr into the first 2ch-sp, join to 3rd st of starting 5ch with a ss. Round 6: as Round 4. Round 7: ss into 2ch-sp, 5ch (counts as 1tr, 2ch), 1tr into the same 2ch-sp, 1ch, *(1tr in next st, 1ch, miss 1 st) 12 times, (1tr, 2ch, 1tr, 1ch) in next 2ch-sp; repeat from * another 2 times, (1tr in next st, 1ch, miss 1 st) 12 times, 1tr into the first 2ch-sp, join to 3rd st of starting 5ch with a ss. Round 8: as Round 4. 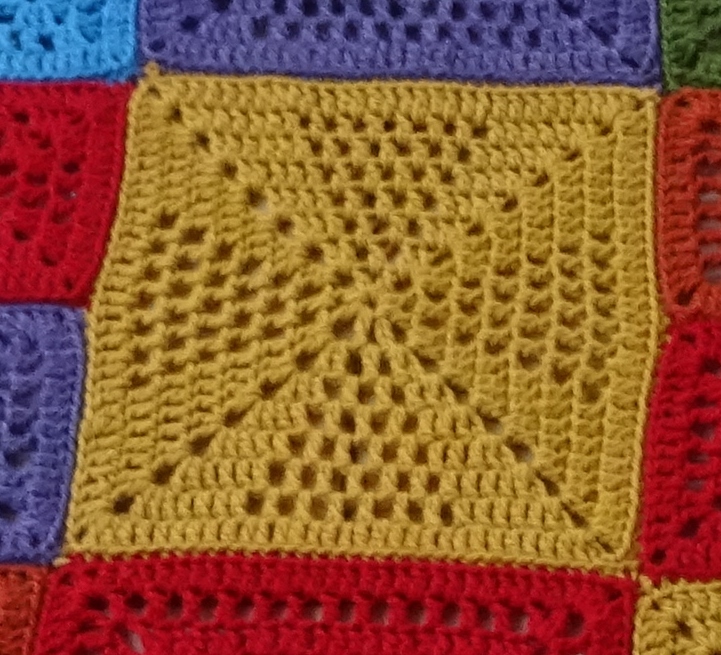 Thinking ahead, some of you may think this larger square could pose a few joining problems, because if you join with a wide seam you may find 4 joined smaller squares end up a little bigger than one larger square. But do not worry I have 2 layouts for you and a solution if you want wide seams. Tune in next week for another large square! Break yarn and fasten off, leaving a long tail of about 3m for sewing or crocheting together later. You should have 15tr along each side and a 2ch-sp at each corner. Make as many as you like of these but I made a total of 16, 1 each in Purple Mix and Olive Mix, 2 each in Forget-me-not and Orange Mix, 3 each in Blue and Red and 4 in Goldenrod. 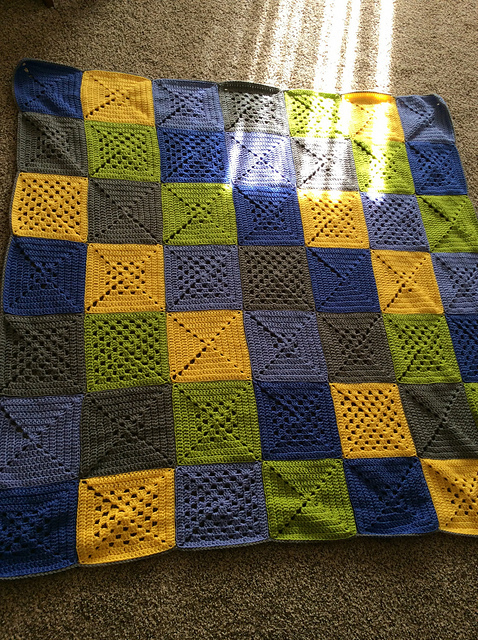 Please join in the discussion and share your progress on my Ravelry forum here. And tune in next week for square number 3. 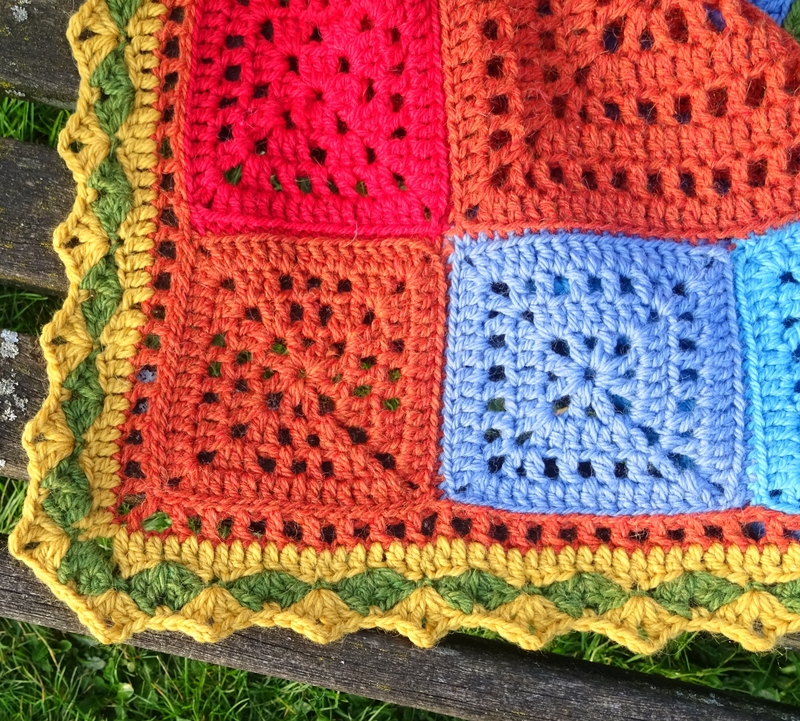 Last week I posted a few photos from the Christmas Blanket CAL with a hint of a new CAL to come. Today I am launching that CAL. 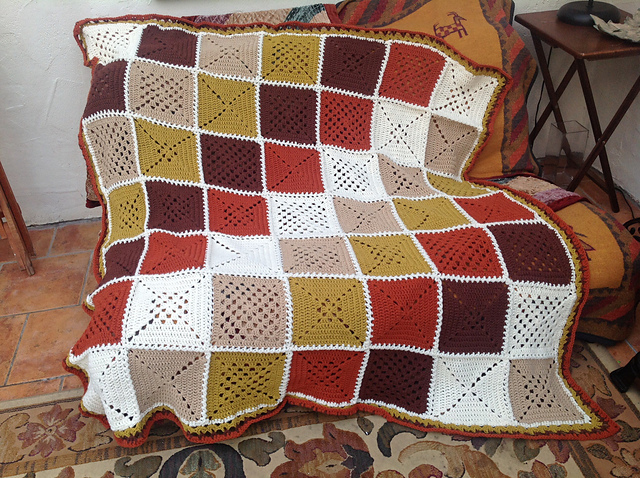 This is the Blog Blanket CAL 2015, and I’m launching it now because I know some people have decided to have a ‘stash down’ for Lent, using yarn in their stash for the whole of Lent. 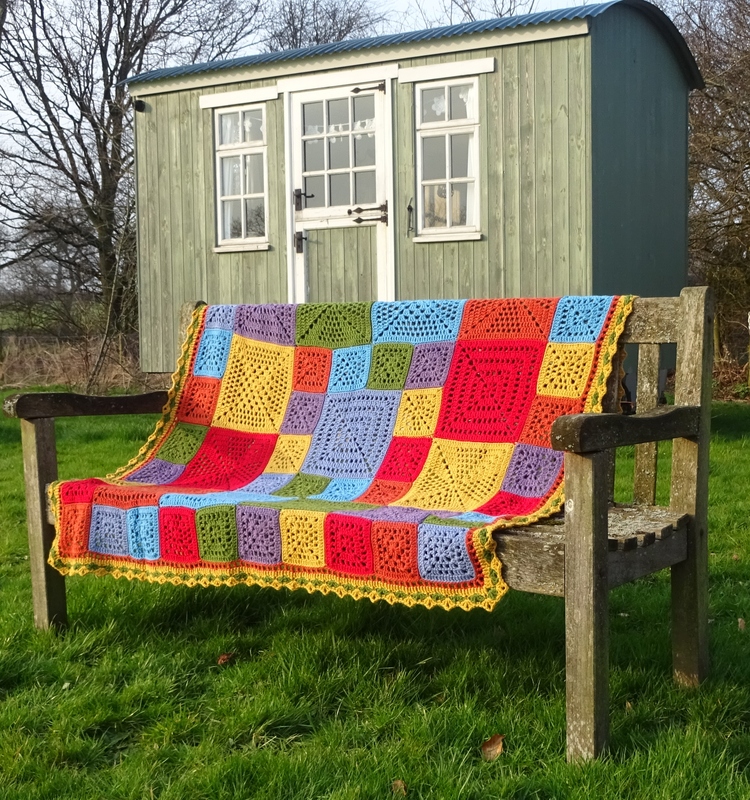 This blanket is a great stash buster, if you join in you will find that your stash diminishes quickly – freeing up space in your yarn cupboard for when you next go shopping! So what type of blanket is it? 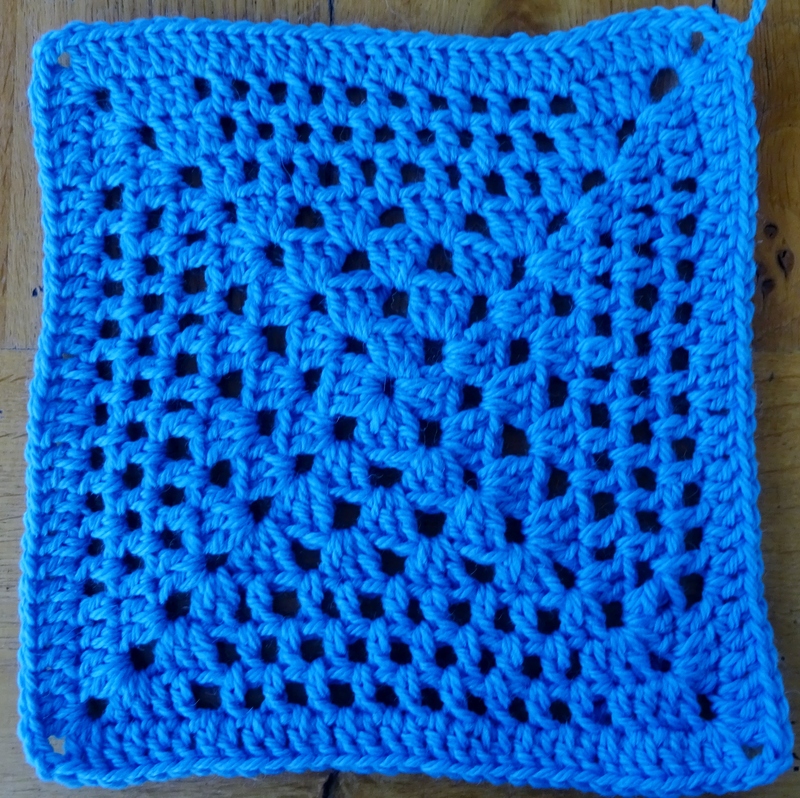 There are no complicated stitches – it uses chain, treble (US double crochet) and slip stitch, and for the border maybe a few other stitches like double crochet and half treble. There are 6 styles of square – each will be published at weekly intervals. You can use as many of the styles as you like. 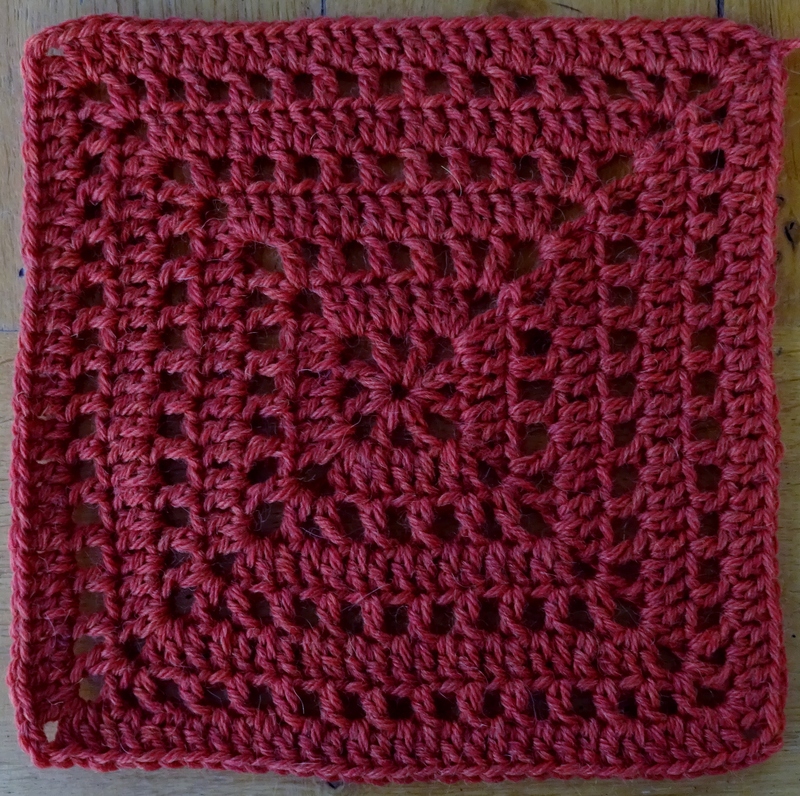 I am making mine in one colour per square, but you can use lots of colours if you like. I will publish 2 types of layout towards the end of the CAL, but you can follow any layout you like and make it as big or small as you like. I am using aran weight yarn but you can use any yarn provided you use a suitable hook size. 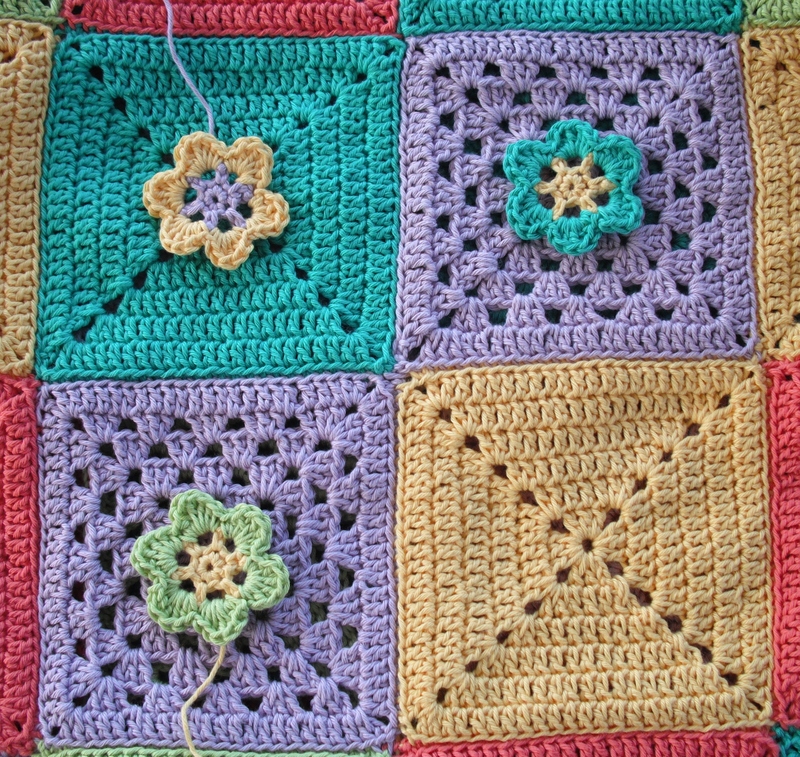 The finished size of mine will be about 1.2m (4ft) square but I haven’t decided what I will be doing for the border yet, so it may be a bit bigger. For the main blanket I am using 21 balls of Drops Nepal, 75% wool/25% alpaca, 50g/75m per ball in 7 different colours. 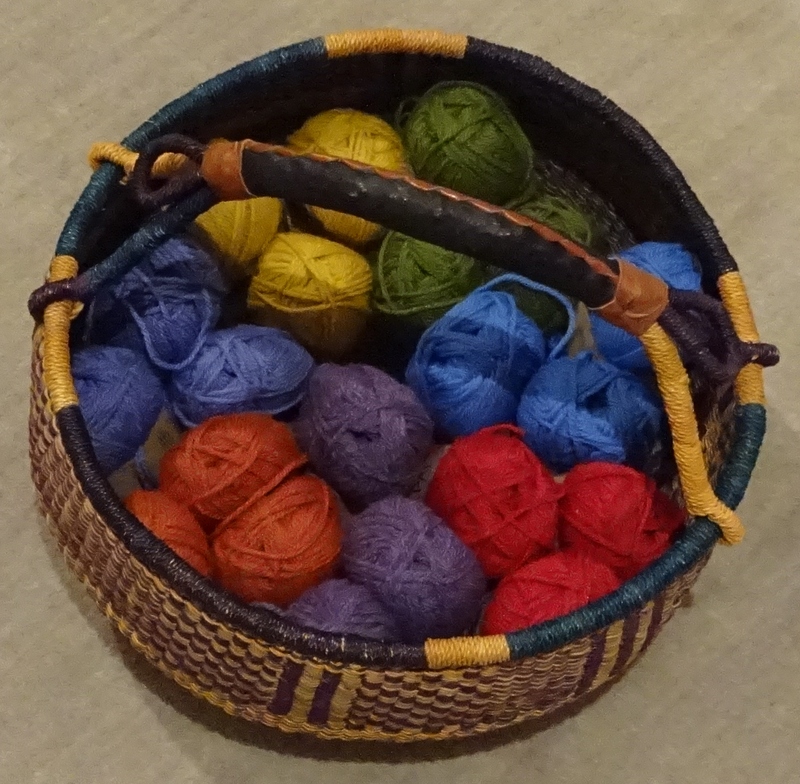 The border will need more yarn – maybe another 3 balls. And I am using a 4.5mm crochet hook. 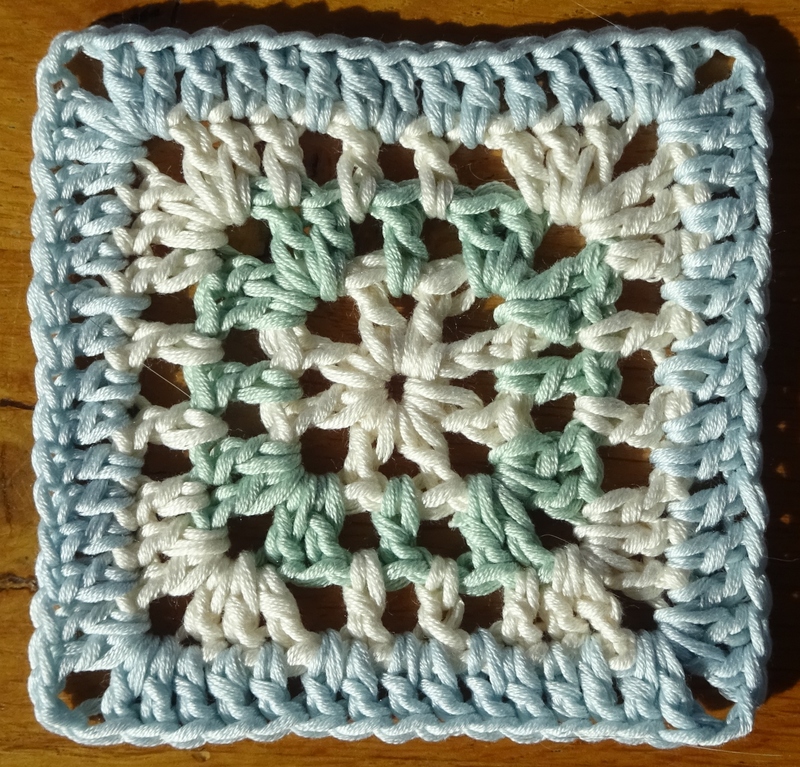 Next week I will publish the first square, I hope this gives you enough time to gather your thoughts and your stash! Christmas CAL final part – THE BIG REVEAL! Happy New Year! I hope you celebrated the turn of the old year in suitable style. First I will explain my edging. I wanted something simple. 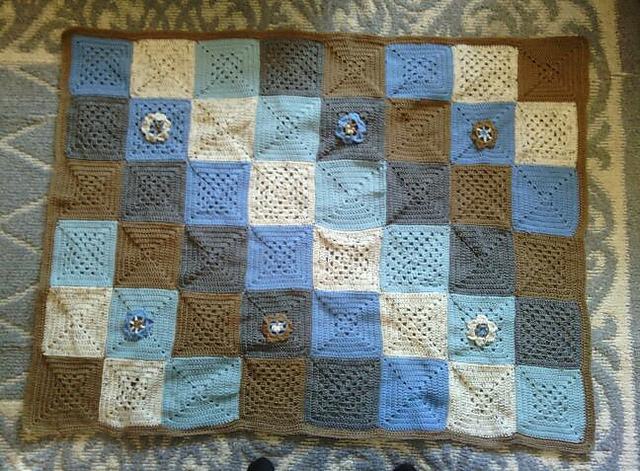 In fact when I had joined my motifs I liked the look of the blanket so much that I almost didn’t do an edging. But not doing an edging is a crochet sin! All blankets need something firm along the edge to hold the whole shape. I experimented with several ideas and settled for the simplest. 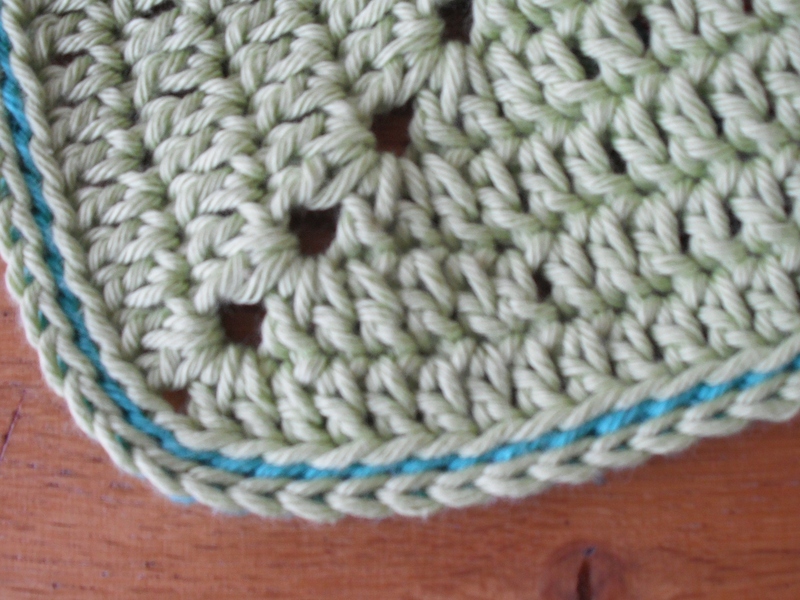 I expect you think I did a double crochet edging, this is simple isn’t it? Well I didn’t. 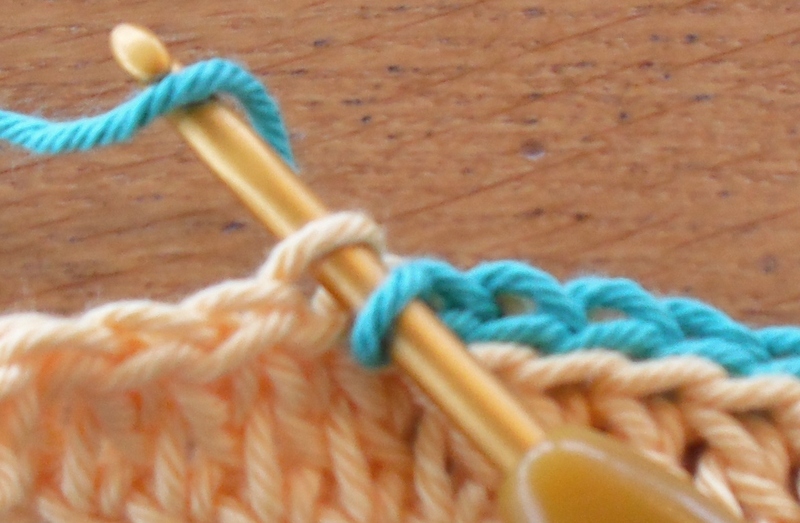 The simplest edging is slip stitch, and I did 2 rounds of slip stitch. To maintain the same effect that I achieved with the joining of the motifs, the slip stitch edging was done into the back loop only. This leaves the front loop of each motif to ‘frame’ the motif. So the first edging round was done into the back loop of every stitch along the sides (that works out at 25 per motif edge). 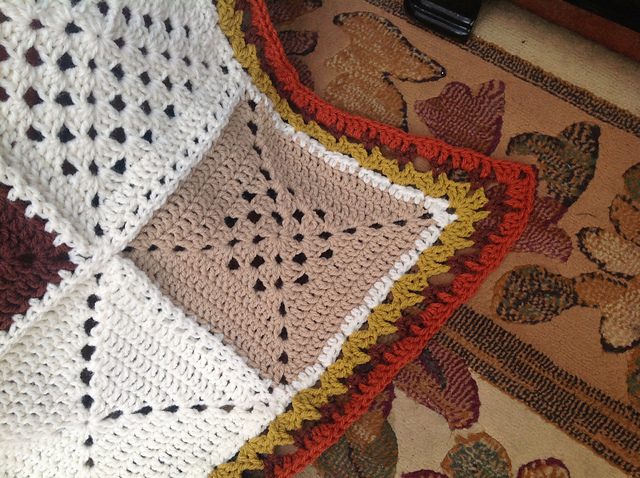 Once you have completed the first round you will find the blanket has a nice firm edge. Actually I think this simple round give a good finish, but I wanted a little more. The second round went into the back loop of the first round. When the second round is complete you’ll see that only the front loop of the first round is showing. So choose your colours carefully as the second round is the predominant colour. 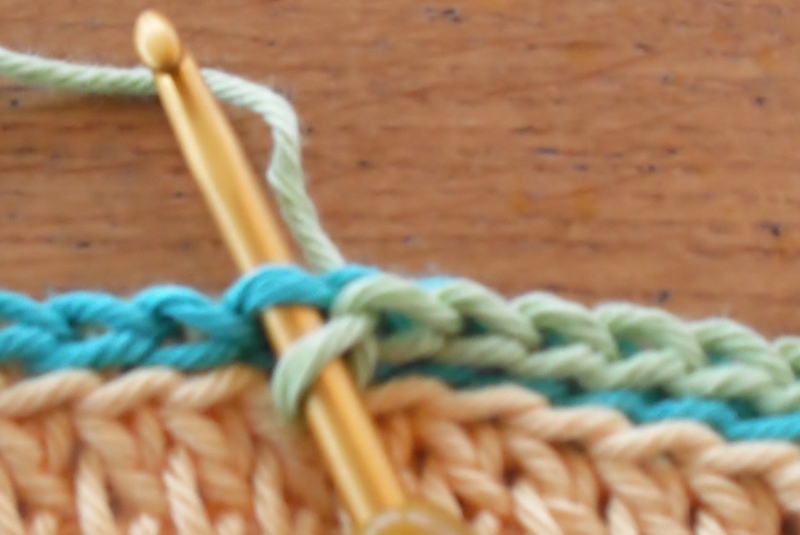 I didn’t do any extra stitches in the corners, I don’t think it necessary when it is just 2 rounds of slip stitch. And it creates a gentle curve at the corner. No little embellishment have been added (yet!). If you look very closely you may notice that I didn’t quite follow the layout plan. The colours are the same but the motifs are slightly off plan. This is because, as I mentioned in part 4, I was running out of some colours so adjusted the order of motifs I made a little bit. Now I’ve shown you mine – please show me yours! 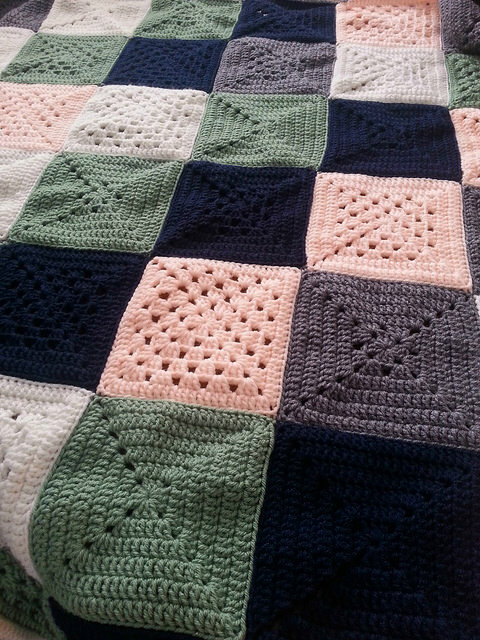 I have finished my blanket now, but I will save the big reveal until New Year’s Day. Today I am sharing my little embellishment. 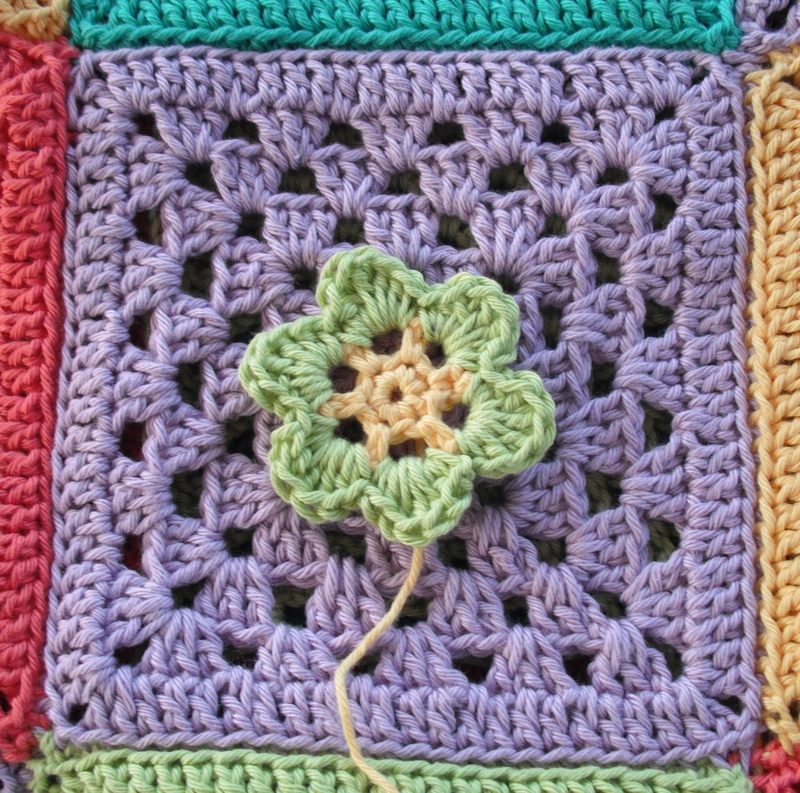 Regular blog readers may recognise this flower, it is the Anniversary Crochet Flower that I designed and published here. I used one colour for the first 2 rounds, then swapped to a different colour for the last round. I think it is perfect as a little embellishment. What do you think? 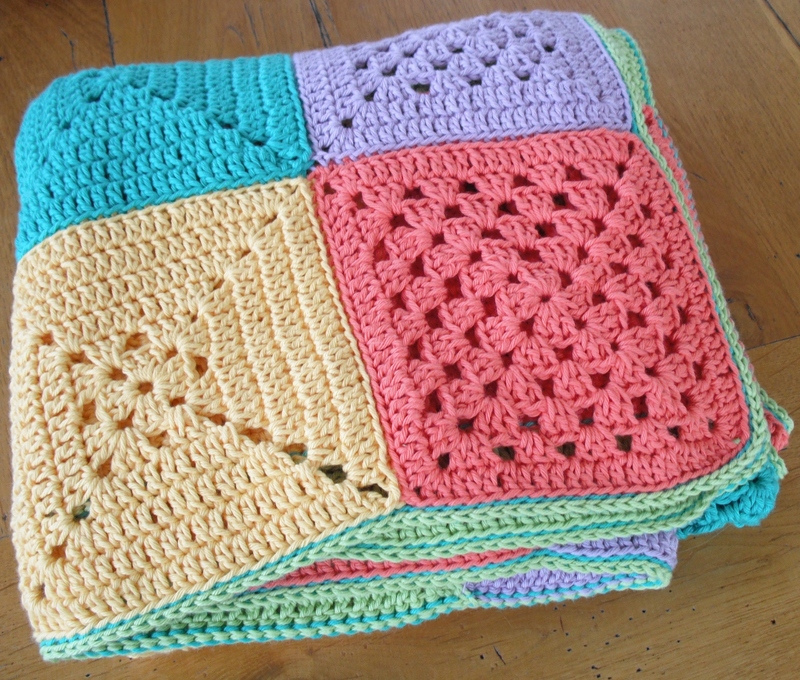 Maybe you should wait until your blanket is joined and edged before making these, as you don’t want to run out of yarn! 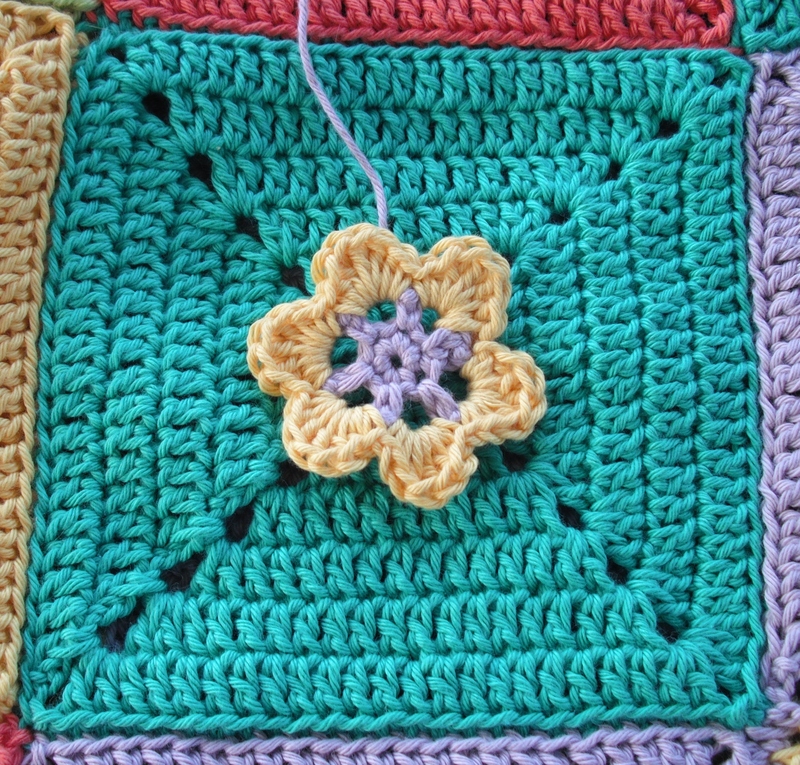 But you can practice on some scraps, as these little flowers don’t use too much yarn. I still haven’t decided whether to add them to my blanket (hence the long tails haven’t been cut off yet as they will be needed for sewing on), I think my blanket zings already………..decisions, decisions……. Tune in tomorrow for the final part and THE BIG REVEAL!